After the Kennedy baseball team made an unexpected run at the state semifinals behind the strength of a varsity roster where 10 of 15 members were freshmen or sophomores, it's only fitting that the Trojans' youngest players were honored in the 2A/1A Baseball All-State awards this year. Three members of the Trojans — freshman Brady Traeger and sophomores Bruce Beyer and Sam GrosJacques — were named to the 2018 All-State team after helping to guide Kennedy to 23 wins and a 13-1 conference record to return the Special District 2 crown to Mount Angel this year. Traeger earned Second Team consideration for his play in the outfield, while Beyer and GrosJacques were named to the Third Team for their efforts in the infield and outfield, respectively. Though Traeger earned his recognition on the All-State team among the outfielders, it was his presence on the pitcher's mound that proved to be most valuable to the Trojans throughout the season. 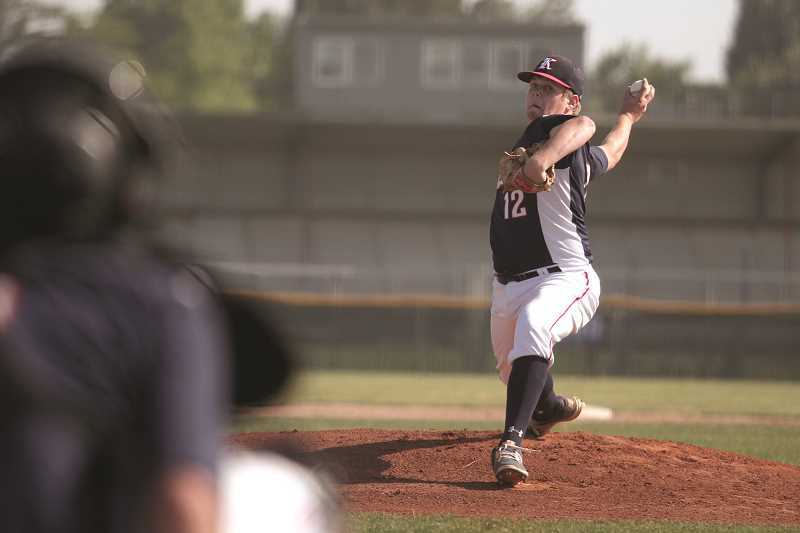 Traeger's poise on the mound was well-beyond that of most freshmen, giving Kennedy coach Kevin Moffatt little hesitation about throwing him up against the eventual state champion Knappa Loggers with the season on the line in the semifinals last month. "You'd think he'd be a little fazed, but if he was, he kept it under wraps pretty well," Moffatt said. "He's been that kid all year. He's been in those situations and won big games for us against Mennonite, Regis, Santiam, St. Paul." Traeger was a perfect 9-0 heading into the game against Knappa, which beat Kennedy 6-3 to hand Traeger his only loss of the season. Traeger led the team with 53.2 innings pitched to go along with a team-best 49 strikeouts and a 2.35 ERA, second-best on the team among pitchers who threw more than four innings. "Just a heck of a year for that kid," Moffatt said. "He's mature beyond his years." Traeger was perhaps even better on the opposite side of the mound, leading the team in nearly every offensive category at the plate. The freshman had team-best numbers in hits (40), triples (1), home runs (1), RBIs (33), on-base percentage (0.527), slugging percentage (0.565) and OPS (1.092). He was also second on the team with seven doubles and 31 runs scored and reached base 19 additional times due to either drawing walks or getting hit by pitches. The two sophomores — Beyer and GrosJacques — came close to matching Traeger's production on offense. Beyer's team-best 24 walks, combined with 30 hits for a 0.370 average, helped him tie Traeger in on-base percentage, leading to a team-best 34 runs scored and 24 runs batted in. GrosJacques was close behind, recording 31 hits for a 0.344 average to go along with 13 walks and 11 times hit by pitches for a 0.478 on-base percentage. He added 27 runs scored — third-best on the team behind Traeger and Beyer — and 19 RBIs, and joined Traeger as one of four members of the Trojans to record a triple on the year.